Opening Day On Logan Pass along the Going To The Sun Road in Glacier Park on July 13, 2011. Montana weather can be summed up in two words: ever-changing. Weather in Montana can also be accurately described as being quite extreme. 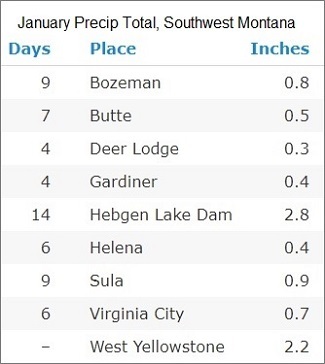 With this in mind, the one thing that Montana visitors must be aware of is that at any time of the year, you can have any time of weather in Montana. 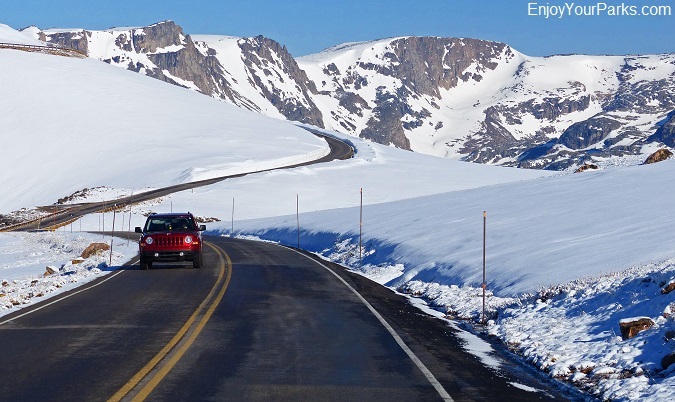 For example, you can be enjoying a warm, 80 F day with clear skies in the middle of August, and in a blink of an eye, you can find yourself in a classic Montana blizzard... especially in the higher elevations of Yellowstone Park or Glacier Park. The same thing goes for winter weather in Montana. 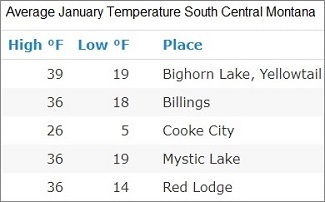 It can be -30 degrees F below zero one moment, and then a Montana Chinook can come through and in a few short hours it can be +50 degrees F above zero. Therefore, the bottom line is this: ALWAYS BE PREPARED for any type of Montana Weather at anytime, whether it be winter, spring, summer or fall. 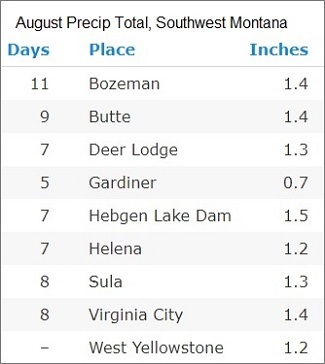 MONTANA WEATHER: BOTTOM LINE FOR VISITORS- PREPARE FOR ALL TYPES OF WEATHER! When visiting Montana, even during the summer, we highly recommend that you bring clothing for all weather conditions, especially if you are going to be in the mountains such as in Glacier Park or Yellowstone Park. Snow storms can hit the state during any month of the year, as well as sharp temperature swings. This can become a life-saving decision while hiking or mountain climbing in Montana, because hypothermia can become a serious issue even in July and August. So make sure to bring layers... such as a thin base layer for hot temps, a fleece jacket for colder weather, and a breathable, water proof shell that also serves as wind protection. A warm hat and gloves should also be in your day pack or overnight pack at all times. The good news is that Montana weather, as ever-changing it may be, typically allows for gorgeous summers and falls, which makes for fantastic summer vacations. 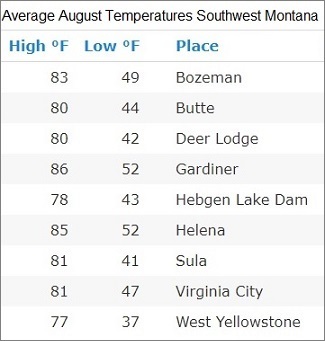 That's not to say that at anytime you can have a horrific cold spell come through with snow or freezing rain, but in general, the state of Montana a wonderful place to enjoy terrific summer weather. 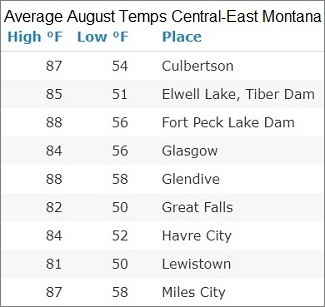 And no matter how hot a day might be, nearly every evening during the summer and fall in Montana are cool and pleasant, averaging between 50 to 60 degrees F.
Aside from the random cold spells that can hit at any time during the summer in Montana, which can bring snow and/or freezing rain, the other major element that people need to be aware of in Montana are the common lightning storms that occur on a regular basis... especially during the hotter months of July and August. These lightning storms can be dangerous to anyone enjoying the great Montana outdoors. Typically these storms begin to brew in the afternoon of hot days, as clouds known as "thunderheads" begin to build in the sky. When hikers or mountain climbers see these clouds, long before they begin to hear the thunder in the distance, they need to get off any open pass, ridge, slope or summit immediately and head for lower, covered ground. You do not want to be the tallest object on a huge, open alpine meadow or mountain summit, as lightning tends to strike the tallest structures in the area. For the Montana winter enthusiasts, Montana winters are typically "epic" for all types of outdoor winter recreational activities, whether it be downhill skiing, cross country skiing, ice fishing, dog sledding, snowmobiling, snow shoeing and any other outdoor winter sport you can think of. 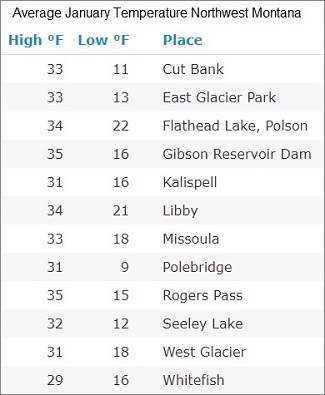 But keep in mind, winter in Montana is again, "ever-changing" and can change from being quite pleasant to becoming dangerously cold in very short periods of time. And the reverse is also true as Montana typically has 6 to 8 cold spells each winter that is followed by a warm Chinook wind. 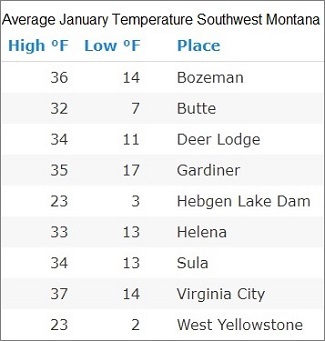 Montana weather is different than places like Minnesota or other Midwest/Great Lakes states where they have extended cold spells, because Montana has what are known as "Chinook Winds". These winds are made up of warm air, which seem to always come through after an extended cold snap with a lot of snow fall. When these Montana Chinook winds come through, the temperature can climb 50 degrees F in a matter of hours. And with these Chinook winds, much of the low elevation snow is melted away. That's why when you drive through Montana in the winter time, there will be many occasions where you won't see any snow on the prairie. 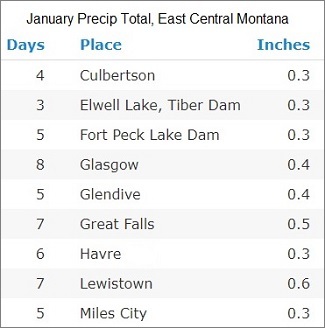 It's because the Montana Chinook winds came in and took away the snow. Another way of putting it is that winter in Montana comes in waves, with about 6 to 8 cold spells separated by warm, Chinook winds. 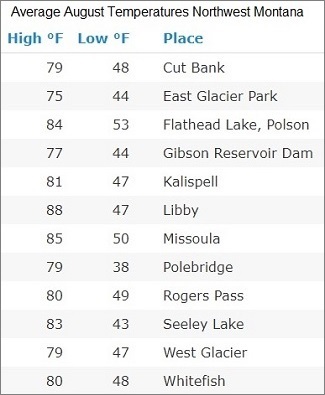 According to the National Weather Service, the average annual Montana temperature is 43.4 degrees F. The average high Montana temperature is 56.6 degrees F, and the average low Montana temperature is 29.9 degrees F. Now before you cancel your vacation plans after reading this... keep in mind that this is combining winter and summer. We'll get to this breakdown later down this page, so please don't panic.... You'll be pleasantly surprised. 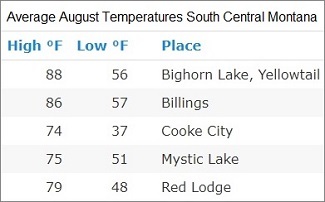 Montana Average Annual Temperature: +43.4 degrees F.
Montana Average Annual High Temperature: +56.6 degrees F.
Montana Average Annual Low Temperature: +29.9 degrees F.
According to the National Weather Service, the Montana annual precipitation average is 15.31 inches, with 184 day of cloudy skies, 100 days of partially cloudy days, and 80 days of clear Montana skies. This is again the statewide average, and a lot depends on exactly where you are in Montana with regard to precipitation and clouds. 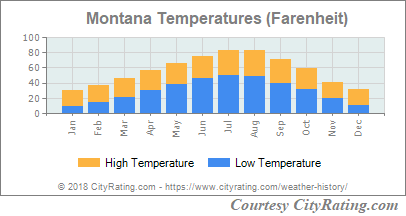 Note: The range between the hottest Montana temperature (+117 F) and the coldest Montana temperature (-70 F) is the largest temperature range in the United States, which is 187 F.
Largest 24 Hour Temperature Drop IN THE WORLD: 103 degrees F (-54 F to +49 F). 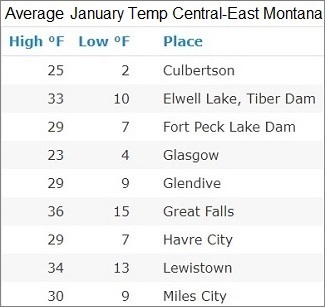 Fastest Temperature Change in the United States: Great Falls, Montana. The largest and quickest temperature drop in the United States: Fairfield Montana where in just 12 hours, the temperature plummeted 84 degrees F.
The largest snowflake ever measured in the United States: Montana on January 28,1887 at 15 inches in width. 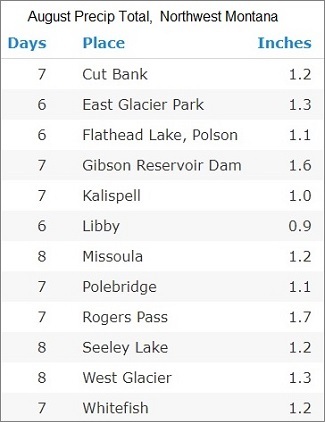 Montana 24 Hour Precipitation Record: Circle, Montana at 11.5” on 06/19/1921 – 06/20/1921. Montana 12 Month Precipitation Record: Summit, Montana (Northwest Montana) at 55.51” in 1953. 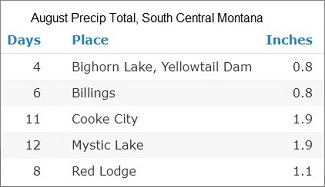 Montana 24 Hour Snowfall Record: Shonkin, Montana (Central Montana) at 48.0” on 05/28/1982 – 05/29/1982. 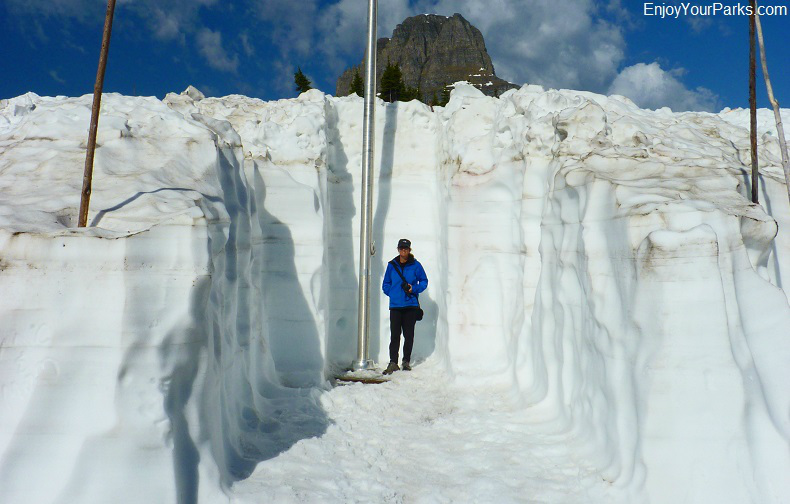 Montana Single Season Snowfall Record: Cooke City, Montana (Northeast Entrance to Yellowstone Park) at 418.1” during the 1977-1978 Season. Late July on the Beartooth Scenic Highway in Montana.